Check out this awesome new Star Wars poster designed by Joshua Budich! 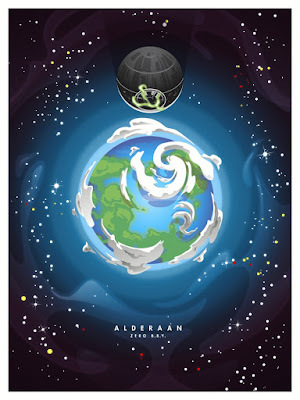 Inspired by Episode IV: A New Hope, “Aderaan” pays tribute to Princess Leia’s adopted planet destroyed by Grand Moff Tarkin and the evil Death Star. “Alderaan” by Joshua Budich is an 18”x24” signed and numbered 6 color screen print. Limited to just 100 pieces, fans can purchase this colorful Star Wars print now at Budich’s online store for just $35.